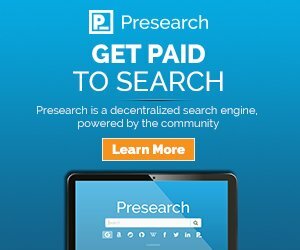 Well Presearch is a blockchain based search engine where you can earn PRE tokens just by searching through presearch.org . You can choose to view the results in Google, bing, coinmarketcap, etherscan, twitter, facebook and many other platforms. So infact it is an all in one search engine which even pays every time you search. Presearch pays 1 PRE tokens for every 4 searches and you can earn upto 8 tokens a day that means 32 searches. You can sign up now through the link below and get 25 free tokens in your account. Join now and start earning tokens and I am sure in no time the price will rise above 1$ and we will have enough to boast that time. It really is. Thank yoy for leaving a comment.